I felt every bump in the road. But the car was empty. Pádraig is, for the first time in eight months, not with us. Early this afternoon, he experienced another very warm welcome in the National Rehabilitation Hospital (NRH) where he will stay until the Irish Health Service Authority will have assessed him for a home care package. Meeting the builders tomorrow morning – that is if I’ll wake up in the morning! Soooo tired tonight. Can’t write anymore tonight. PS: Pádraig’s return to Ireland was shared by 1,530 views of the blog and pictures! Safely home at last.TG What a family & friends . Safely in Dublin, Catherine. Home home and out of the NRH will be the next step! But it’s great to be back in Ireland! What a wonderful welcome home. I just love the photo of Padraig with his family and friends and I’m sure you were hoping for this day for so long. 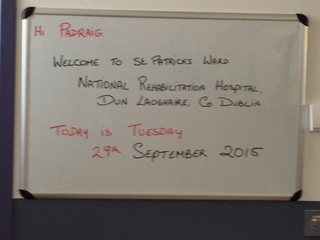 Best wishes to Padraig for his stay in NRH and I’m so pleased your family are back together in Ireland. Thank you, Shirley! We miss you! We must stay in touch and get together either here or in Hamburg some time soon! Hi Hilary, it’s been very hectic but Pat says she’ll write to you real soon. It was very nice to meet you, your brother, and especially Emma in Germany too! Pádraig has a quote by Oscar Wilde in his bedroom at home: We are all in the gutter, but some of us are looking at the stars. – Sounds like a quote Emma would like too!